(Tech Xplore)—A 360-degree sound field is one of the attributes of the newly announced Huawei VR headset. The Chinese manufacturer, said Forbes, " claims that its VR mobile headset is the first to support 3D sound." Engadget agreed, saying these are apparently the first VR headsets to offer 360-degree sound field on the go. 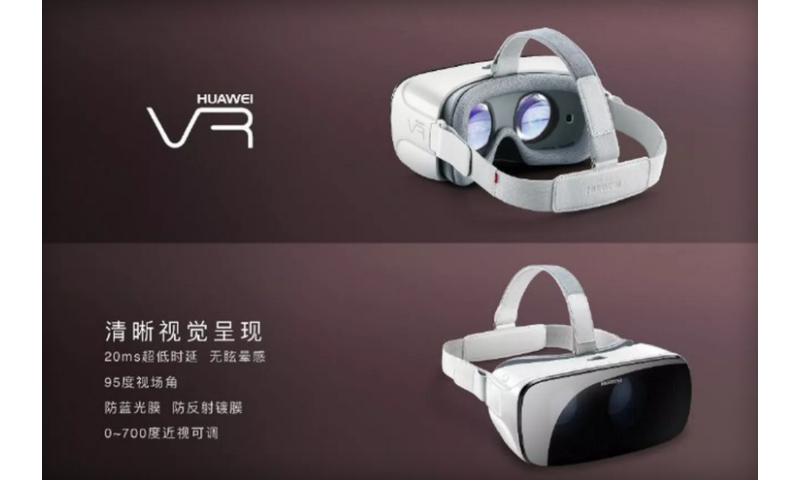 Huawei joins other companies working on VR headsets for smartphones. A number of tech sites saw the product going up against Samsung's Gear VR headset. Like Samsung's product, this one requires a smartphone. The Huawei product works with three phones, P9, P9 Plus and Mate 8. Earlier this month, the P9 and P9 Plus made a debut in London. The company announcement said P9 was equipped with the power, connectivity and speed that a "high-end smartphone user" expects from Huawei. "With a 5.2-inch 1080p display, the P9 is powered by the new Kirin 955 2.5GHz 64-bit ARM-based processor for leading-class mobile performance." As for the P9 Plus, it features a 5.5-inch "Press Touch" display and offers "dual-IC Rapid Charge, giving users six hours of talk time after a 10-minute charge." Rob Triggs in Android Authority said the smartphone provides the display and carries the sensors used for movement detection. The P9 models have 1080p displays. Connection is carried with the use of a USB cable. Triggs said this headset is the first to work with USB Type-C.
Paul Lilly in Hot Hardware had a summary of what the device looks like: "It consists of a plastic chassis connected to a head strap. The chassis pops open so you can plop a compatible smartphone inside, which clips into place." Forbes said there was a "touchpad on its right side for navigating in a VR app and a back button above that." Forbes technology columnist Jean-Baptiste Su eyed the Huawei VR headset at a recent Huawei event in Shanghai. Su said, "The lenses are adjustable and come with an anti-blue light filter to reduce stress on your eyes. And, if you're like me and wear glasses, there's a ring on top of the device to adjust the focus." Hot Hardware said that "Unfortunately you can't wear glasses underneath the Huawei VR, but it will accommodate myopia down to -7.00." According to reports, there has been no word yet on when it will debut or its price. As for content, Hot Hardware said that "users will have access to more than 4,000 movies (only some are likely to be VR), 40 games, and hundreds of panoramic images and tours, all free." Meanwhile, Fast Company earlier this month reported on a new study, VR Industry Report, which predicted that by the end of 2025, there are likely to be 135.6 million VR headsets in use. Nonetheless, wrote Daniel Terdiman, the study found that VR is still "several years away from 'hypergrowth' and mainstream adoption."